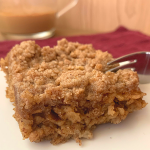 Preview: Healthy Cinnamon Coffee Cake Copycat Recipe is the perfect gluten-free, dairy-free, plant-based, paleo alternative to traditional coffee cake. 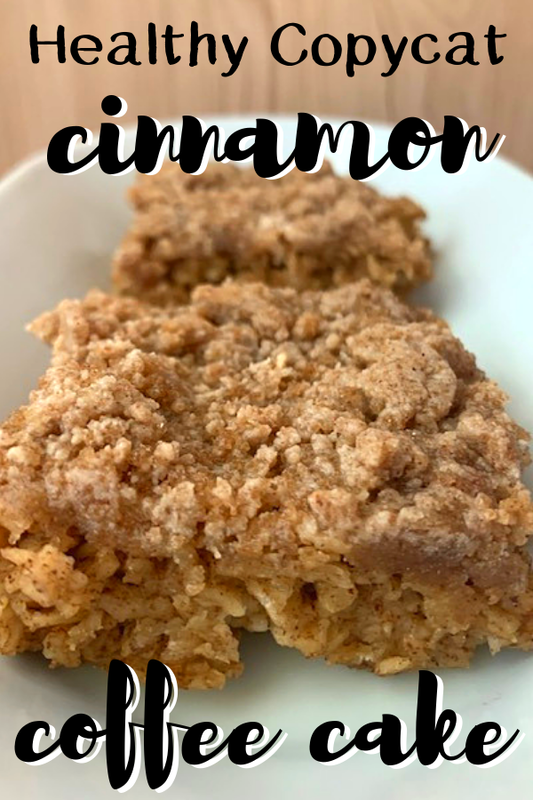 If you love traditional coffee cake but it doesn’t fit your gluten-free, dairy-free, plant-based, paleo diet, then this easy and healthy Cinnamon Coffee Cake Copycat will be your new favorite recipe! 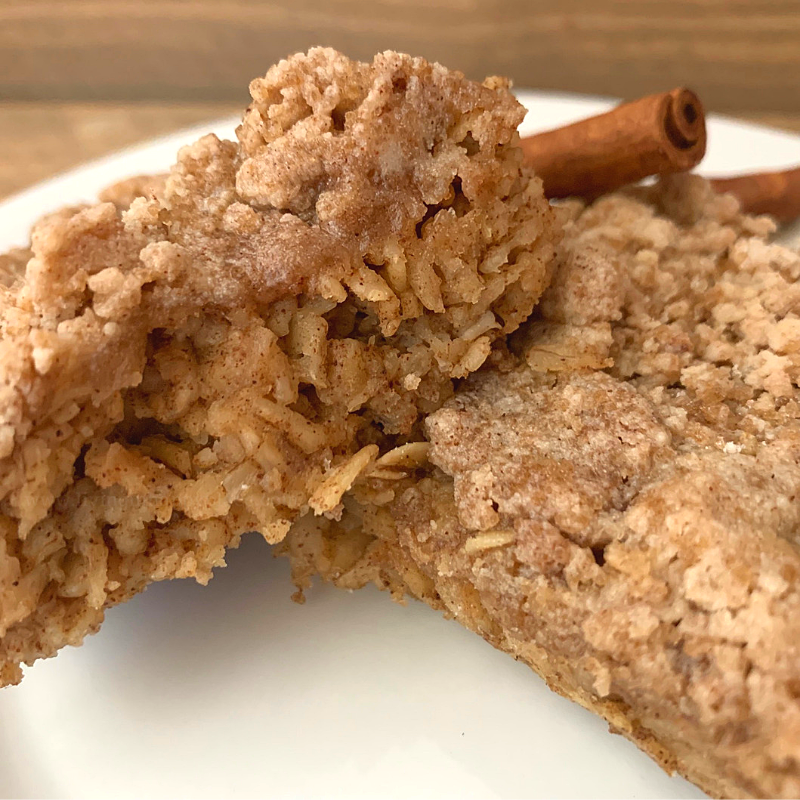 The scrumptious and moist baked oatmeal “cake’ base and cinnamon strudel topping melt in your mouth so perfectly that you might never want traditional coffee cake again! (This post contains affiliate links. As an Amazon Associate, I earn on qualifying purchases). What can I make for breakfast (or dessert) that is healthy AND delicious? If you close your eyes, you can smell the sweet cinnamon and feel the warmth of the “cake” as you lift your fork to your mouth. With one bite, the moist cake and sweet crunchy topping have you wondering whether this is breakfast or dessert. Following that first taste with a sip of morning coffee, you are reminded it IS morning and this breakfast is not only delicious, but it is also good for you. Don’t open your eyes because the kids are probably yelling for you, looking for their bookbags, and running late for the bus. 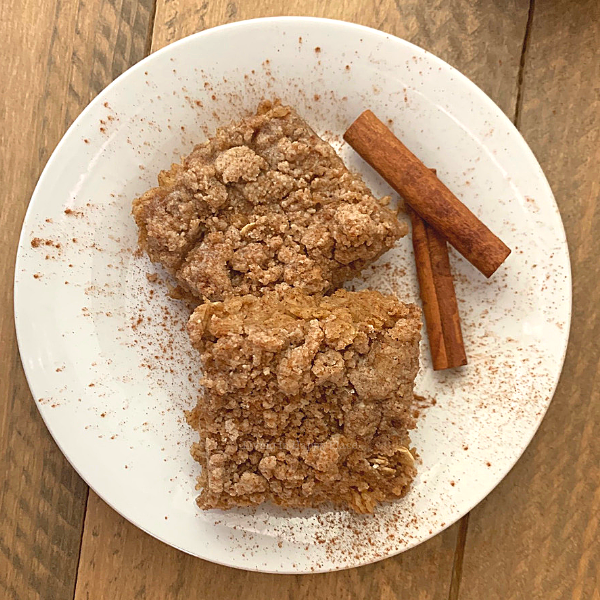 😉 Well, I guess you’ll have to get moving eventually but this healthy Cinnamon Coffee Cake copycat is a small piece of heaven before you have to start the day. This healthy breakfast cake goes so perfectly with coffee that I often crave it with my evening cup. I try to make this recipe at least once a month so I usually have some on hand to heat up. And this easy Dessert Coffee Recipe is the perfect pairing with Copycat Cinnamon Coffee Cake! If I don’t have any of this cake in the house, the kids start asking for “that breakfast with crumbles on top”. My kids ate the entire dish of this breakfast in one sitting. No one will be able to tell it is gluten-free, dairy-free, and paleo but they might notice it must be made of scratch to be this delicious! In a large mixing bowl, all ingredients and stir until combined. Pour into greased baking dish and spread evenly. Prepare the crumble topping by adding all ingredients into a bowl. Using a fork, combine by smashing the butter and folding. When the ingredients start to combine, I use my fingers to squish everything together until ingredients are combined and butter starts to form crumbles. Sprinkle on top of the oatmeal “cake”. Bake uncovered for 35 minutes. Remove and allow to cool a bit before slicing. This recipe can easily be made organic by using all organic ingredients. The banana extract adds just the tiniest (almost undetectable) hint of banana flavor. Your guests will probably taste something that makes this dish amazing but not be able to put their finger on what it is! I think it is what makes this cake so irresistible. You can always use vanilla extract or omit it altogether if you prefer. I refrigerate leftovers for about 2 days. Reheat in the microwave for about 15 seconds per slice. I have frozen batches of oatmeal bake for about 1 week and reheated in the oven when needed. I cut into slices first and wrap in parchment paper before freezing. When ready to eat, I heat in the oven on 275 for about 15 minutes or until the center is warm. The kids love to grab these as a snack when running to practices and they are also great as a healthy after-school snack. This delicious “cake” is so versatile it can be a healthy breakfast or a quick and easy and delectable dessert! ~ Add a scoop of ice cream (or your favorite non-dairy alternative!) and chocolate sauce on top of a warm piece of “cake” for an irresistible “a la mode”! ~ Top with sliced bananas and caramel sauce! ~ Mix 1/2 cup chocolate chips (I love this gluten-free brand!) into the batter before pouring into the baking dish to make this a Healthy Chocolate Chip Cinnamon Coffee Cake! Breakfast Apple Nachos Recipe you won’t be able to resist! 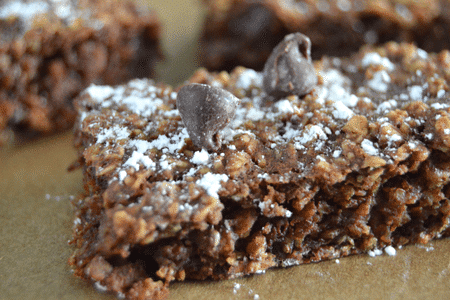 This healthy twist on breakfast brownies will knock your socks off! Healthy Cinnamon Coffee Cake Copycat Recipe is the perfect gluten-free, dairy-free, plant-based, paleo and delicious alternative to traditional coffee cake! In a large mixing bowl, add all ingredients and stir until combined. Pour into greased baking dish and spread evenly. Prepare the crumble topping by adding all ingredients into a bowl. Using a fork, combine by smashing the butter and folding. When the ingredients start to combine, I use my fingers to squish everything together until ingredients are combined and butter starts to form crumbles. Sprinkle on top of the oatmeal "cake". See, you can have your cake and eat it too! Even if you are eating gluten-free, dairy-free, or paleo, Healthy Cinnamon Coffee Cake is a delicious breakfast or sweet dessert! This looks delicious and I love that it’s healthy too! I am a big fan of coffee cake. It brings back memories of my mom’s friends coming over for coffee on Saturday mornings. That is so sweet! I love how food can hold such wonderful memories. Mmmm looks very tasty..could really use a slice to go with my cuppa right now! I didn’t know that cinnamon coffee cake could be healthy — love it! Yum, perfect for with a morning cup or as an afterschool snack. Yes please! I could definitely go for some of this right now. Oh my…this looks delicious! Would be perfect for Easter brunch! Hi! I’m “Happy Place Mom”! Fun Mom Gear Designs by LIHP! Join the Happy Moms mailing list and get your free copy of "10 Ways to Build Bonding Into Everyday Tasks"!